Aldrich, John H., and Richard G. Niemi. 1996. “The Sixth American Party System: Electoral Change, 1952-1992.” In Stephen C. Craig, ed., Broken Contract? pp. 87- 109. Ansolabehere, Stephen, and Shanto Iyengar. 1995. Going Negative: How Political Advertising Shrinks and Polarizes the Electorate. New York: Free Press. Brady, Henry E., Sidney Verba, and Kay Lehman Schlozman. 1995. “Beyond SES: A Resource Model of Political Participation.” American Political Science Review 89: 271-294. Brehm, John, and Wendy Rahn. 1997. “Individual-Level Evidence for the Causes and Consequences of Social Capital.” American Journal of Political Science 41: 999-1023. Campbell, Angus, Philip E. Converse, Warren E. Miller, and Donald E. Stokes. 1960. The American Voter. New York: Wiley. Clarke, Harold D., and Marianne C. Stewart. 1994. “Prospections, Retrospections, and Rationality: The ‘Bankers’ Model of Presidential Approval Reconsidered.” American Journal of Political Science 38: 1104-1123. Conway, Margaret. 2000. Political Participation in the United States – 3rd ed.. CQ Press. Franklin, Mark N. 1996. “Electoral Participation.” In Comparing Democracies: Elections and Voting in Global Perspective, ed. Larry LeDuc, Richard G. Niemi, and Pippa Norris. Thousand Oaks, Calif.: Sage. Highton, Benjamin, and Raymond E. Wolfinger. 1998. “Estimating the Effects of the National Voter Registration Act of 1993.” Political Behavior 20: 79-104. Inglehart, Ronald. 1990. Cultural Shift in Advanced Industrial Society. Princeton: Princeton University Press. Inglehart, Ronald. 1997. Modernization and Postmodernization: Cultural, Economic, and Political Change in 43 Societies. Princeton: Princeton University Press. Kahn, Kim Fridkin, and Patrick J. Kenney. 1999. “Do Negative Campaigns Mobilize or Suppress Turnout? Clarifying the Relationship between Negativity and Participation.” American Political Science Review 93: 877-889. Key, V.O., Jr. 1955. “A Theory of Critical Elections.” Journal of Politics 17: 3-18. Kramer, Gerald H. 1971. “Short-Term Fluctuations in U.S. Voting Behavior, 1896-1964.” American Political Science Review 65: 131-143. Lau, Richard R., Lee Sigelman, Caroline Heldman, and Paul Babbitt. 1999. “The Effects of Negative Political Advertisements: A Meta-Analytic Assessment.” American Political Science Review 93: 851-876. MacKuen, Michael B., Robert S. Erikson, and James A. Stimson. 1992a. “Peasants or Bankers? The American Electorate and the U.S. Economy.” American Political Science Review 86: 597-611. MacKuen, Michael B., Robert S. Erikson, and James A. Stimson. 1996. “Comment on [Presidents and the Prospective Voter].” Journal of Politics 58: 793-801. McDonald, Michael P., and Samuel L. Popkin. 1999. “Measuring Turnout Rates Correctly: Rates are not Declining in Recent United States Elections.” Unpublished paper, Vanderbilt University. Miller, Warren E. 1992. “The Puzzle Transformed: Explaining Declining Turnout.” Political Behavior 14: 1-43. Mitchell, Glenn E., and Christopher Wlezien. 1995. “The Impact of Legal Constraints on Voter Registration, Turnout, and the Composition of the American Electorate.” Political Behavior 17: 179-202. Niemi, Richard, and Herbert Wiesberg. 2001. Controversies in Voting Behavior – 4th ed. CQ Press. Nie, Norman H., Jane Junn, and Kenneth Stehlic-Barry. 1996. Education and Democratic Citizenship in America. Chicago: University of Chicago Press. Nie, Norman H., and Lutz Erbring. 2000. “Internet and Society: A Preliminary Report.” Stanford Institute for the Quantitative Study of Society, Stanford University. Norpoth, Helmut. 1996a. “Presidents and the Prospective Voter.” Journal of Politics 58: 776-792. Norpoth, Helmut. 1996b. “Rejoinder.” Journal of Politics 58: 802-806. Rosentone, Steven J., and John Mark Hansen. 1993. Mobilization, Participation, and Democracy in America. New York: Macmillan. Southwell, Patricia L., and Justin I. Burchett. 2000. “The Effect of All-Mail Elections on Voter Turnout.” American Politics Quarterly 28: 72-79. Teixeira, Ruy A. 1987. Why Americans Don’t Vote: Turnout Decline in the United States, 1960-1984. New York: Greenwood. Tullock, Gordon. 1967. Toward a Mathematics of Politics. Ann Arbor: University of Michigan Press. Wattenberg, Martin P. 1997. “The Crisis of Electoral Politics.” The Atlantic Monthly 282 (4): 42-46. ISNAD Akhmetkarimov, Bulat . "Revisiting the Profile of the American Voter in the Context of Declining Turnout". 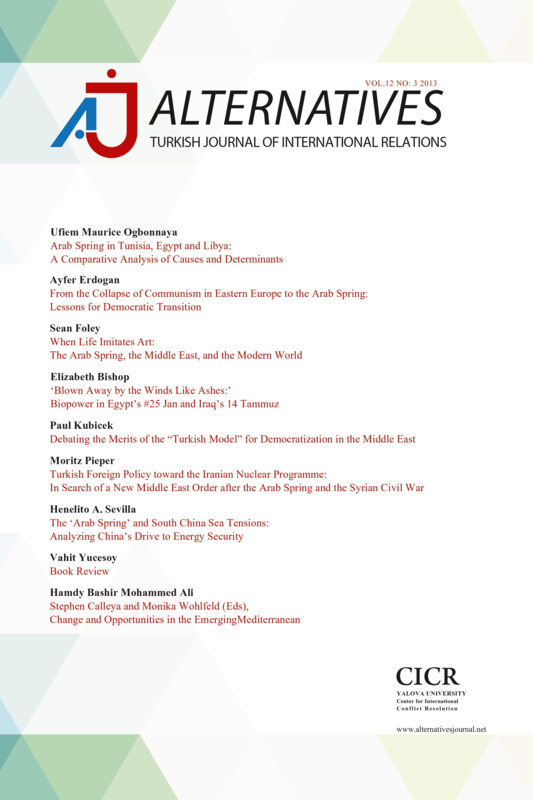 Alternatives: Turkish Journal of International Relations 7 / 2&3 (September 2008): 111-133.